I was just casually watching television on Sunday night - laptop on my knee as per usual, waiting for the final of The Apprentice to start when that tweet scrolled through my timeline (yes I follow James Jordan - feel free judge me because I deserve it - however, he does offer good commentary on Strictly Come Dancing). Anyway, I couldn't help but reply to him, wondering if it was a badly placed 'joke' to start off with but it so obviously wasn't. 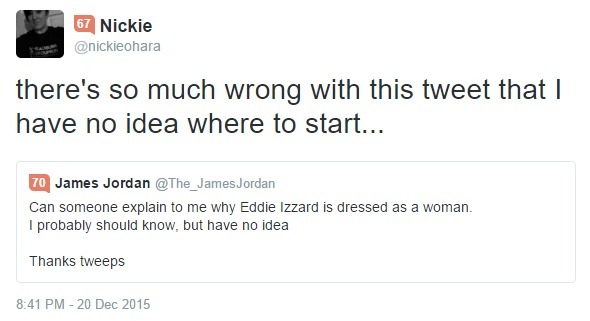 Quite surprisingly, James replied to my aghastness so I expanded further, explaining that (a) he had a world famous search engine at his fingertips if he chose to leave his Twitter app for a couple of minutes and that (b) Eddie Izzard has done a huge amount to bring cross-dressing awareness to the mainstream. I believe you have had to have had your head in a box not to have even even had Eddie Izzard on your radar at some point. Other people continued the conversation with me, attempting to justify James' theory using Topshop and their "mens' clothing" and "women's clothing" sections which, if you are fairly closed minded, is probably a valid argument but remains a media-led way of marketing and does not, and should not, define the person who is wearing them. I lost the will to live when one person told me that they also hadn't known (in fairness, she was very young and said she'd asked her parents which is probably a better way to source the information needed) and another said, "You learn something from Twitter every day". So where am I going with this? I'm just so shocked that people use Twitter (or social media in general) as a form of education or as their one-stop-shop for obtaining information. I've seen people retweet articles from The Onion believing that they are true which probably means that I could spout all sorts of shite (some may say I already do) and be considered an oracle. I've talked about this on many occasions before - we are lucky to have the internet at our fingertips and it doesn't just stop and start with a closed community following the 140-character spoutings of famous and non-famous people. Let's use this amazing tool to its full advantage rather than a place to be complete and utter uneducated wankers who express continued narcissism or who insult a whole community of people with just a few words in a tweet. 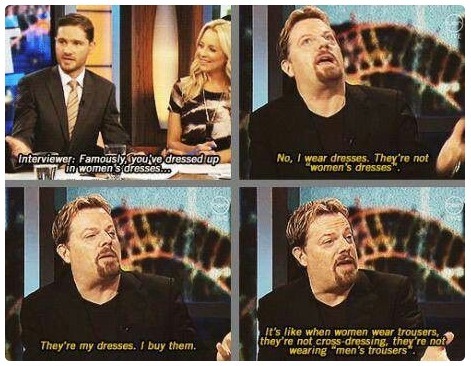 For those of you reading and still don't know who Eddie Izzard is or why he "dresses as a woman", you'd do really well to start here and then watch these.